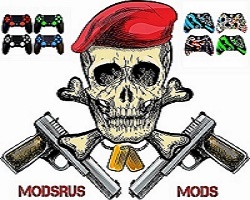 Our modded PS4 controllers, modded Xbox One controllers and modded PC controllers. Have just a ton of great features that will help you have an edge in the COD game we are looking at today! Infinity Ward are the developers behind Infinite Warfare and after the extreme negative backlash to the initial trailer, they must have wondered what they did wrong. People loved Advanced Warfare and the future sections of the last two Black Ops games, but many felt, Infinite Warfare took things too far. Which is a shame really as Infinite Warfare is a very well made game. The story really is the most “epic” of the franchise as literally the whole solar system is being fought over. Captain Nick Reyes is who you play as and you will go to distant planets and space stations trying to stop the SDF from taking over the galaxy. The story is very well done. With great voice acting and a pretty darn good script. It is like you are playing a role in a sci-fi movie. As well as your first person shooter sections, you had zero gravity and some vehicle sections to mix things up a bit which was pretty cool. While multiplayer was great, Zombies was where it was at. Infinity Ward really stepped up their game with Zombies. It was called Zombies In Spaceland and saw you run around a 1980’s theme park trying to survive waves of zombies, it is awesome! There was also plenty of Zombies DLC, each one having its own theme. For some, the main selling point of Infinite Warfare was the special edition that came packaged with a remastered version of the original Modern Warfare. This was a huge selling point and saw many gamers go for the special edition. In all Infinite Warfare is a fantastic first person shooter, but sadly for some people, it was too sci-fi and that was why they did not like it.